Popular Irish priest Fr Brian D'Arcy has been censured by the Vatican. Or, as the Irish media tells us, Fr D'Arcy has been muzzled, silenced. One columnist even referred to the Vatican "bullyboys" giving Fr D'Arcy the "mafioso treatment." The Irish media can be a tad emotional at times. Fr. D'Arcy was censured, apparently, for articles he wrote for the Sunday World newspaper in 2010. Fr. D'Arcy has been a weekly columnist for the paper since 1976. He is also has a regular slot on BBC Ulster radio and a regular contributor on other Irish radio and television stations. The Irish media can rely on Fr. D'Arcy to tweak the hierarchy whenever the opportunity arises and he's generally described as a "liberal priest." Fr. D'Arcy is more than just a media darling, he is also a member of the National Union of Journalists, as I learned over the weekend. One outraged journalist's tweets seemed to indicate that the Church was not entitled to censure Fr. D'Arcy seeing as he is a member of the union. I find that last tidbit more than a little odd. Why is a Catholic priest a member of labor union? After all, his primary occupation, the job that puts food on his table, is his position as a priest. He is also a member of the Association of Catholic Priests in Ireland. I know being a priest is not like working for a bank or a software development company or a professional sports team, but nonetheless in a practical sense the Church is an organization with employees and a mission just as banks, software developers and sports teams are. Do they have employees who are members of the National Union of Journalists? All of those employers have employees who deal with the press. Banks, software developers and sports teams have official spokesmen, who provide the 'voice of the organization,' but they also have employees who offer opinions on what is going on in their business or even the wider world. For example, you'll often hear a bank employee on the radio talking about the economy or the industry. Some bank employees write regular columns in newspapers. Software development personnel seemed to be asked regularly for their views on education. Members of professional sports teams are all available to the media for comment on their own play, sometimes on the trends in the game and occasionally on issues that have nothing to do with sports. Again, are any of these people members of the NUJ as well? I doubt it. All these people – the banker, the software developer, the athlete – all write or comment under a censor of some sort. They all know there is a line that their employers won't let them cross. Message. That's one of our modern day buzzwords. You gotta stay on 'message.' The bank, the software company, even the professional sports team all want to "stay on message." So does the Catholic Church. Fr. D'Arcy wasn't staying on message. In fact, he's made a habit of calling into question the management of the organization he works for and even the "product" they're selling, if you can forgive my crudeness. So the Church reprimanded him. They didn't silence him. They told him he can go on writing his column and doing his piece on the BBC, but his media work has to be run past a Church censor; they want to make sure he stays on message or at least does not go too far off message. Is this a good idea? Will censuring and censoring Fr D'Arcy work for the Church? I don't know, but I'm skeptical. Fr. D'Arcy is not my cup of tea, but he doesn't shock me. Ever. 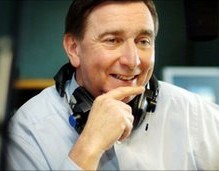 In fact, I hardly listen to him when I hear him on the radio because he's always saying the same thing. He never surprises. I doubt anyone in Ireland is ever surprised by Fr. D'Arcy. Therefore, it seems to me censuring Fr. D'Arcy will accomplish little other than providing succor to those who love bashing the Church – and they've had lots of that lately. I can see no real up-side to this. On the other hand, in this internet age, it's possible Fr. D'Arcy's newspaper columns and radio work could well be sowing confusion in far-flung places. For all I know Fr. D'Arcy straying off message is wreaking havoc with the Church's work in the Philippines or Uruguay or even El Paso for that matter. That seems unlikely to me, but I don't know. I'm not charged with running a 2000-year-old organization with a billion members, millions of employees and global reach. Keeping such a vast organization on message is a mighty task. Censuring Fr. D'Arcy might be the right option, but it just feels ham-fisted.